Right on time for the May/ June deadline I have these lovely Bee blocks finished for Melanie. This is a paper pieced block called 'Wanta Fanta' designed by Blossom Heart Quilts. There is a free PDF downloadable on her website. 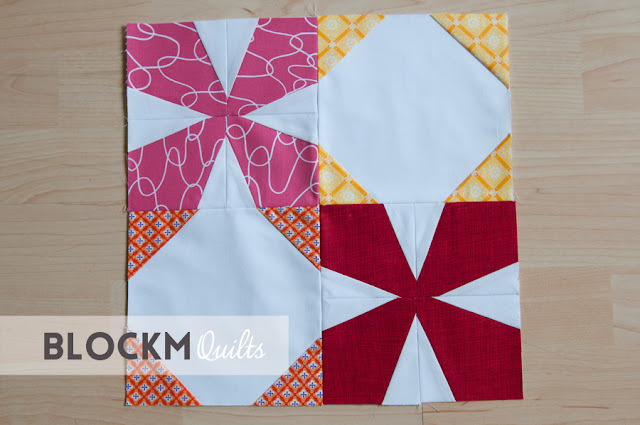 Melanie had her focus on red, purple and pink fabrics with a little orange and yellow. 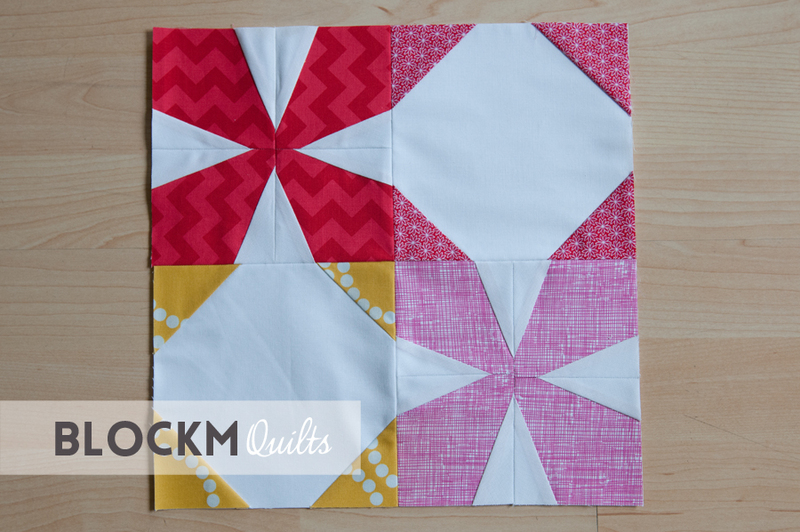 I really like these blocks and I'm sure the quilt will turn out great! It only was my third time doing paper piecing and I really enjoyed it. Blocks are going in the post tomorrow! 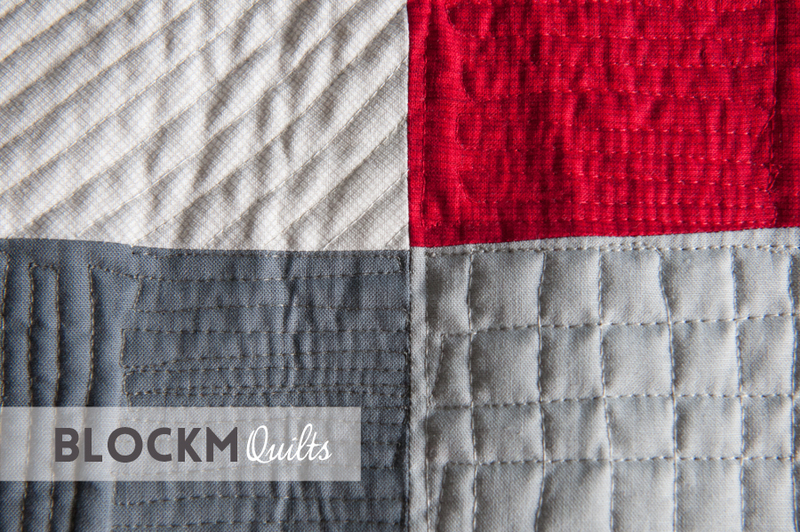 Linking this to the Modern Cologne Quilters and Crazy Mom Quilts. I still can't believe it! 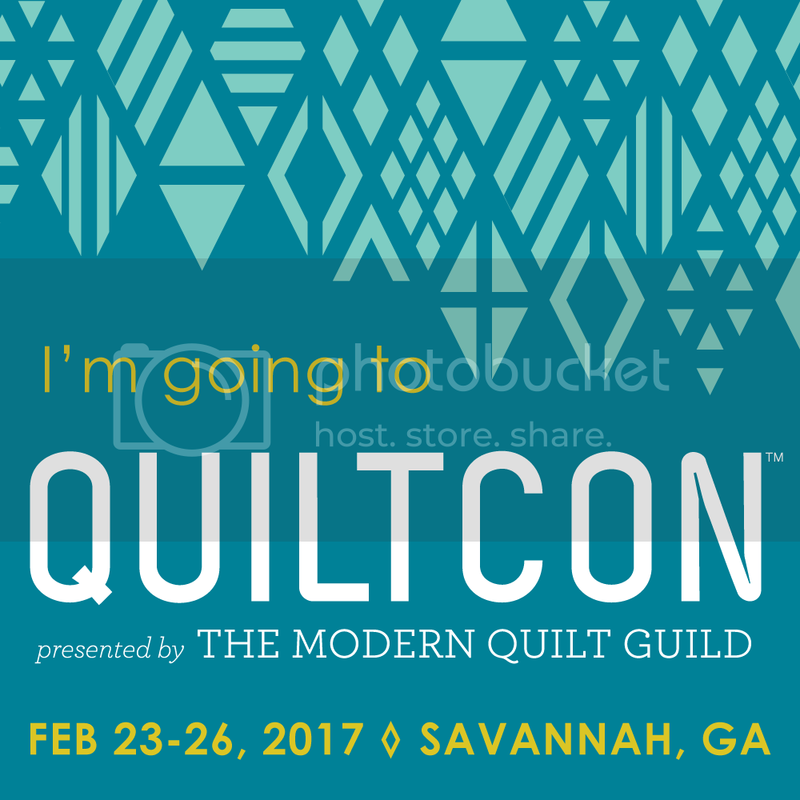 I have registered yesterday for QuiltCon East in Savannah next February!! I couldn't decide on lecturers so I went with the full four day lecture pass for more flexibility. I didn't really feel like taking a class, but I booked one anyway. So that I'm not there and then thinking why I didn't book a class. So that's the 3-hour-class I booked: Quilt Remix: Turn a Traditional Block into a Modern Quilt with Riane Menardi of Vessel Quilts. Oh, I can't wait! Hope to meet loads of people as well. 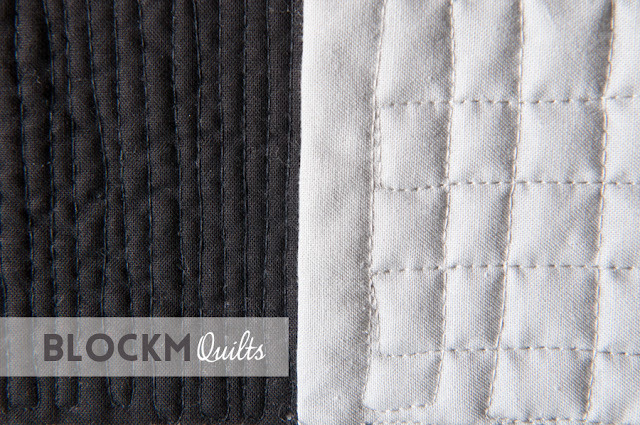 If you're going to QuiltCon as well, get in touch! 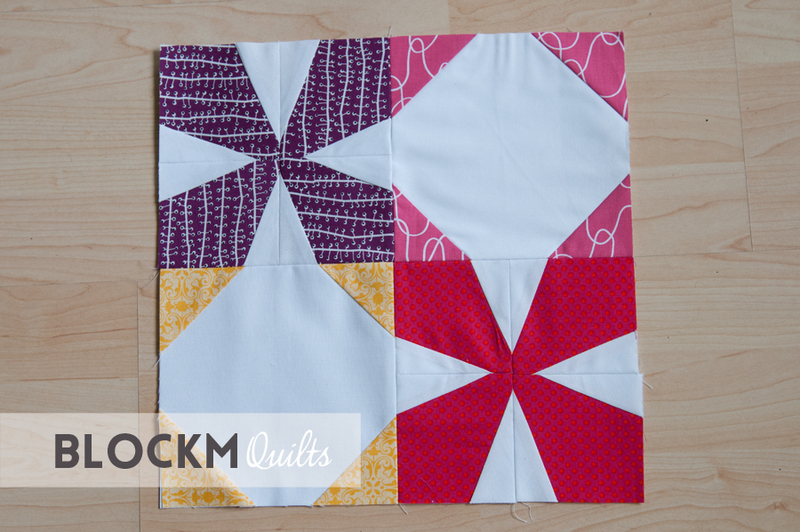 I just noticed that I hadn't posted about my bee blocks for Magda! 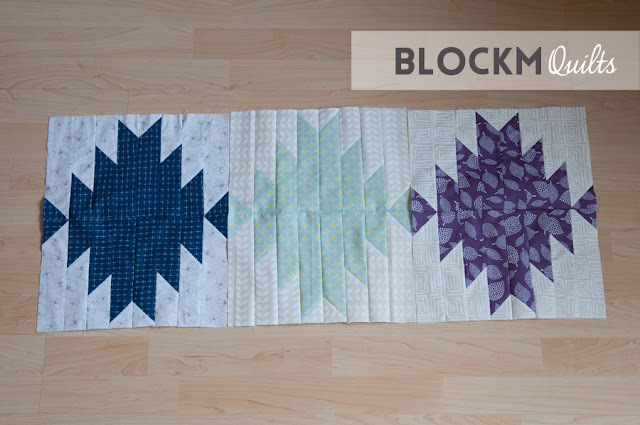 The block is called 'Scrappy Mountain Majesties' and there is a free pattern available here. Magda picked a lovely colour palette with dark blues, purples and turquoise. I have actually started these blocks at a sewing meeting in Hamburg in March. It's the 'Modern Patchwork Treffen' organsied by my fellow bees Melanie and Allison. If you live in Northern Germany and want to sew with some lovely ladies make sure to contact either of these two and pop by! Because my own sewing machine is very heavy and uncomfortable to carry I asked my Mum if I can have her sewing machine to bring with me to the meeting. Isn't that a beautiful machine? It's probably older than I am but its working just fine! It has just a few stitch options but straight really is all you need. The presser foot pressure is adjustable (I cannot do this on my machine! ), I can lower down the feet dogs and do free motion quilting (I tried it all out!) and it has a 1/4" sewing foot. How cool is that? 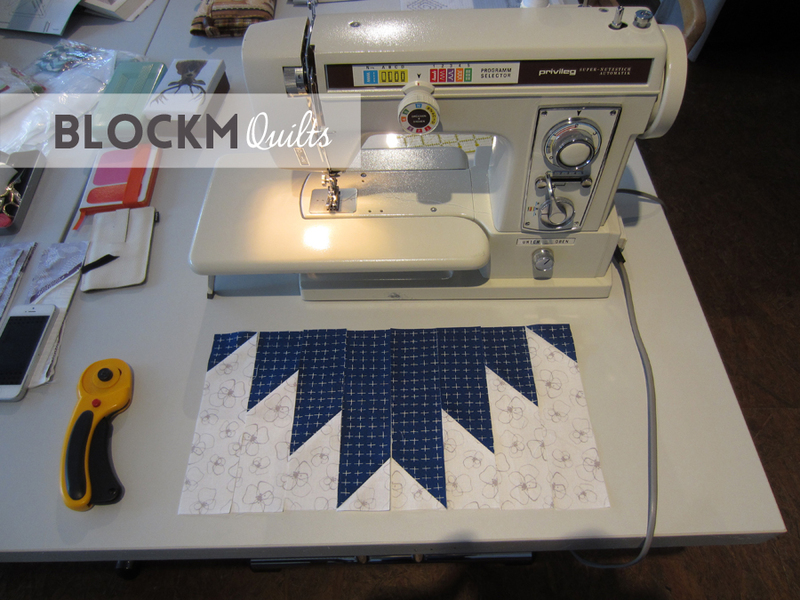 Oh, and the extended sewing table of course is great for quilting. All in all a very enjoyable sewing experience. Machine, location and company that is! 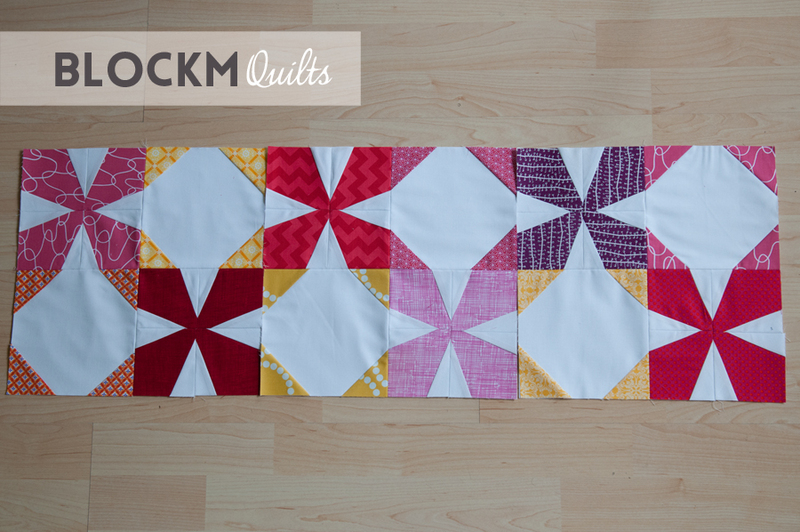 I'm looking forward to seeing that quilt finished, I'm sure it will be great! 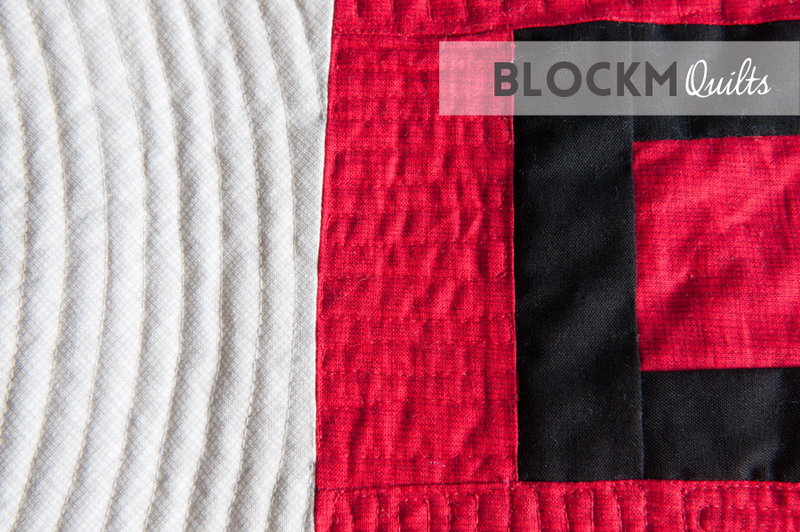 Sometimes the work on a quilt seems overwhelming. Do you know that feeling of slight frustration while working on a quilt? That feeling that there is no end to it and that this quilt will never be finished? Well, that happened to me. It's not that it's not looking the way I'm hoping for, I'm actually quite happy with the way it's turning out. I just have feeling it takes forever. Maybe it's the colours? Grey, grey, grey, grey, grey black, oh and red! We also have a lot of rain and thunderstorms here, summer just doesn't want to come. I'm usually working on a few projects, but not too many. Too many unfinished projects make me feel unease and I loose focus. That also happend to me. To distract me from my never ending quilt I started other projects. Too many projects for my taste. I have three pillow cases in the making, I'm still seam ripping my Sea Breeze quilt every now and then, I'm playing with my design wall rearranging my tulip bee blocks and dreaming of at least three more quilts to make. So I stopped blogging and I also stopped sewing. Sewing and writer's block, so to say. Creative slow down. I think these 10 Tips to Instant Sewing from Debbie of a Quilter's table brought me back on track. Time obviously is an issue. But I decided to take it slow and not put too much pressure on myself, sewing is supposed to be fun, isn't it? To be organised with that sometimes very little time is key. So made a To Do List and will stick to it. Working my way through my projects making sure I have gratification and fun in small steps. 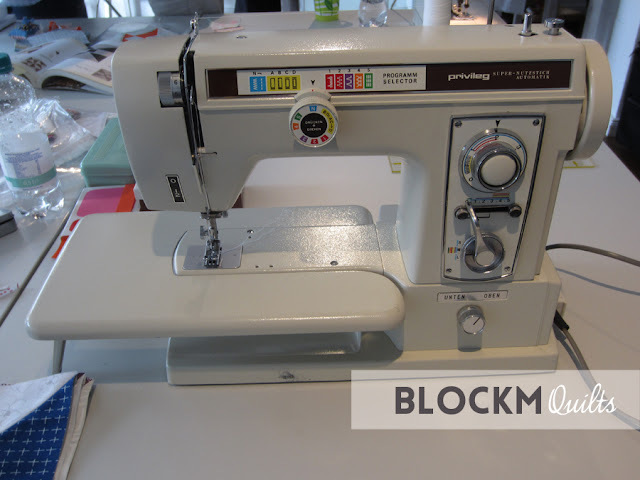 Because not sewing and not blogging is also not a solution! Linking this to Modern Patch Monday of the Modern Cologne Quilters and to Sew Cute Tuesday at Blossom Heart Quilts.